Howard student Taylor Johnson goes fashion-forward the day after the Huffington Post list was released. There is no rolling out of bed and donning a pair of (mostly) clean sweatpants before heading off to morning lecture for college students these days. At least not over on 6th Street. Howard University students are the District’s -- and pretty much the nation's -- definition of chic, according a new list by The Huffington Post. The HU campus is home to the second-trendiest dressers in the country, says HuffPo, which cites Women’s Wear Daily: Students dress to convey “an air of confidence, a sense of where they’re going” -- thanks to bright pink blazers, bold animal prints, vintage blouses and slim-cut letterman jackets. 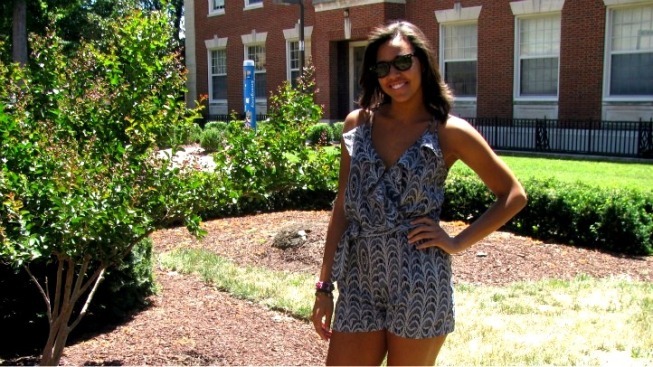 College Fashionista shares weekly fashion posts from campus -- "Fashion never stops at Howard University." New York University, formerly attended by BoHo postergirls Mary-Kate and Ashley Olsen, snagged the top spot on the best-dressed list. Fine, New York, fine! You always have to act better than us. Whatever. Meanwhile, the Olsens previously told Style.com that their homeless-chic flair was actually just a result of the bitter cold and laziness. And although neither of them graduated from NYU, they've nonetheless parlayed their know-how into several successful clothing lines. Howard students, we're looking at you to do the same.